Provides winter capabilities while maintaining competitive wet and dry performance. Provides biting edges for excellent snow and ice traction without reducing tread element stiffness. The snow groove enhances the retention of snow in the outer circumferential grooves to capitalize on the higher traction characteristics of “snow on snow” versus “snow on rubber”. 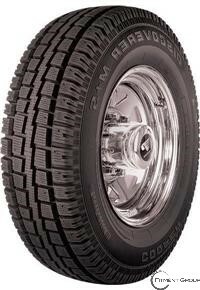 Further enhances winter performance while maintaining excellent wet traction. The sipes are deep to provide performance benefits throughout the life of the tire. SAWTOOTH CENTER CIRCUMFERENTIAL RIB AND BLOCKY TREAD ELEMENTS	Enhance stability and even treadwear in all types of weather conditions. A MULTITUDE OF STRATEGICALLY-PLACED STUD PIN HOLESDelivers optimum traction on ice. Evenly distributes contact pressure for balanced treadwear.